In August of this year, we did a big family vacation at Wild Dunes in Isle of Palms, South Carolina. From Colorado, Tennessee, and the other end of South Carolina, my parents and siblings with their kids gathered for a week at the beach, and we all had a great time -- especially all 5 little girl cousins. 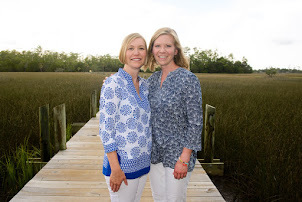 Three years ago we planned a similar vacation (with fewer children at that point) in Folly Beach, South Carolina, and that's when I reached out to my old friend, fellow quilter, and Charleston resident Kelly about getting together and swapping table runners and scrap bags. Here's the result of that swap, which was loads of fun. I love my table runner from Kelly and have it hanging on the wall of my guest room now. Since I was going to be in Kelly's neck of the woods again, I asked her about getting together and doing another swap. This time we settled on mini quilts, and we both got to work, sharing a couple of sneak peeks along the way. And when I was on vacation with my family, Kelly came by for a visit with her parents, who were in town to see her from Ohio. The other thing about me and Kelly is that we went to college together and her parents are my godparents! Long ago our parents were best buds in Indiana, and they haven't seen each other in 18 years -- how cute are they?! Back to the quilts. I decided to make this patchwork pineapple for Kelly because it's crisp and bright and the pineapple is a symbol for welcome. I'd seen it here and there online and thought it would be perfect for her. I added some simple hand quilting in perle cotton to accent it without being distracting. And Kelly! She made me this amazing mini quilt of kittens, with lots of low volume fabrics and bits and pieces of pastel prints -- including some from the scrap bags we exchanged three years prior! Surely we're quilting kindred spirits, because Kelly hand quilted hers with perle cotton too, giving the kittens whiskers and adding decorative x's and stars and lines to add texture and interest. I just love it and it has found a home on the wall in my house where I can admire it as I walk past it all the time. I love this little tradition of ours and can't wait to see what we swap on our next visit! My niece Penny, who is almost 3 now, loves little blankets and got very attached to a small doll quilt that I made her last year. In the majority of the pictures my sister sent me, the plainer back side of the quilt was always facing up! For her birthday earlier this year, I decided to make Penny another small quilt that was two-sided, meaning that it would be cute and colorful regardless of which side ended up. On one side, I used small patchwork squares in bright colors to create a heart with a background of mixed low-volume fabrics. Extra strips at the top and bottom brought this side up to size. On the other side, I created scattered wonky stars in more bright colors. The background fabric on this side is just white. She loved it -- here it is sideways! This little quilt has become one of Penny's favorites, and she takes it almost everywhere. It's good for snuggling on the couch, and she's even shared it with her baby sister. I expect I'll be making more of these small quilts as the girls get older, and I'm not complaining. Small quilts are fast and fun and a great way to experiment with patterns and techniques without committing to a larger project that requires more investment of time and money in materials.